Landscape plants are often subject to damage caused by environmental stresses, including lightning, wind, snow or ice. It is important to know how and when to offer aid to a damaged plant to save the plant from future decay and possible loss. Storm damage can cause wounds that not only disfigure a plant, but also provide entry for disease organisms and insects. Wind injury is usually obvious and not difficult to diagnose. High winds may cause plants to become uprooted, have broken branches and split at narrow crotch angles. Trees can be pushed over by high winds. A large uprooted tree should be removed, but you may be able to save smaller trees. The exposed roots need to be replanted as soon as possible. Sometimes the roots are not exposed but the root zone is lifted up when the tree’s roots are pulled upward. In either case, guy the tree for support for a short period of time until it is reestablished. Some dieback may occur. The extent of damage will depend on the amount of root injury the tree has suffered. Prune any broken limbs immediately, using proper pruning techniques (see HGIC 1003, Pruning Trees). 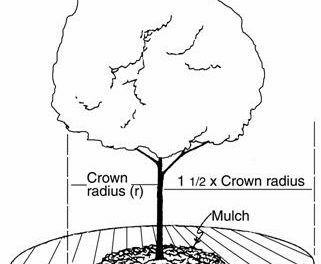 Keep trees mulched and watered, especially during additional periods of stress. There are several things that can be done to reduce wind damage to trees. Help newly planted trees adjust to their new location by properly staking and guying them for a short period of time (no more than one year). Always stake and tie the tree relatively loosely so the stem can move and bend in the wind. Remember, stakes and guy wires are only temporary and must be removed as soon as the tree is established. As a general rule, remove guy wires by midspring from trees planted the previous fall or winter, and eight to 10 weeks after transplanting in spring and summer. Wind damage can also be reduced by not overfertilizing the plant with nitrogen, which can promote top-heavy leaf growth. Avoid over-watering the soil. Plants growing in excessively wet soil may fall, especially after a long period of rain, when the soil no longer gives good support. Keep trees growing upright with one main stem, and remove branches with narrow crotches. Do not overcrowd trees. Tall trees and those growing in open locations are very susceptible to lightning damage. A tree that has been struck by lightning can have many different symptoms. Some trees immediately burst into flames and explode when they are hit, and others show no damage until a later time. Typically, strips of bark extending down the trunk or branches are loosened or burned and may hang from the tree. 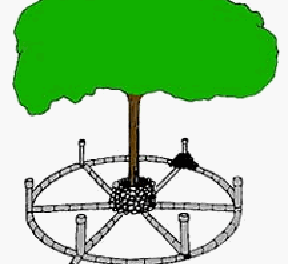 A wide band may be affected surrounding the entire tree cylinder. Extensive root damage can be unapparent from the electrical current that has moved through the tree. The extent and type of damage determines if the tree will live. Prune broken branches and remove strips of loose bark. Reduce other stresses to the plants that can further weaken them, such as dryness or pests. A tree that is weakened by lightning is very susceptible to pests. Lightning that completely destroys plant tissue around the circumference of the tree will prevent translocation of water by girdling it. Valuable old trees can be protected with lightning conductors installed by a professional arborist. Freezing rain accumulation on Southern magnolias can weigh down and break branches. Plants covered with ice or snow can be damaged by an increase in weight load or by careless removal. Branches may break, and high winds can make the situation worse. Evergreen plants are particularly susceptible. Tissues inside the plant that carry water and nutrients throughout the plant may become damaged and remain unnoticed until dieback is evident in the spring. Do not be in a hurry to start pruning a branch which is bent out of shape, since in a few days it will may straighten on its own. Do not remove ice from a plant, since additional damage due to breakage may occur. Rapid temperature changes between cold nights and sunny winter days can cause the bark to crack, especially on the southwest side of the plant. Cankers may form in these areas. Wrap the trunks of newly planted trees with tree-wrapping paper for the first two winters, or paint with whitewash or white interior latex.